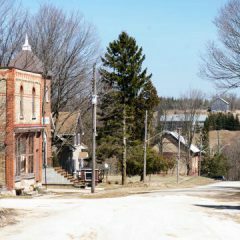 The village of Priceville sits on Grey Road #4 between Flesherton and Durham. Originally established by escaped and freed African-American slaves and United Empire Loyalists who left the US after the American Revolution and named for one of them, Colonel James Price, the original settlement sat along Old Durham Road (now Durham Road B), east of today’s village. At this location, they also established a school, church and cemetery, however none of them remain today. 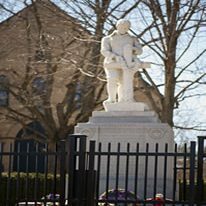 Many of these initial settlers eventually moved north to the Owen Sound area where their myriad contributions have been well documented by an exhibit at the Grey Roots Museum. In the early 1850s, development of what we today consider the village of Priceville was begun by Scottish immigrants who built a saw mill, carriage shop, undertaker’s and eventually even a couple of hotels. Though those buildings remain today as private homes, the centre of the village is almost entirely residential, the exceptions being the post office, a Contractor’s business and St. Andrew’s Presbyterian Church. Cottagers and full-time residents alike are attracted to the rolling hills, meandering river and casual friendliness that Priceville has in spades. The Saugeen River criss-crosses the area, allowing for swimming holes, picnic areas and fishing as well as canoeing and kayaking. Local children make good use of “Priceville Hill” for tobogganing, the playground and baseball diamond, as well as the newly created outdoor skating rink at the local community hall, Stothart Hall. Stothart Hall is also the meeting place for the Priceville Improvement Committee’s annual Canada Day Fireworks and Country Jamboree which attracts thousands each year.